Horizontal Laminair Air Flow Cabinet model IBS – H1100 (previously IBS-DDS), External size : 1060 x 800 x 1690 mm, Internal size:1040 x 500 x 650 mm. Work surface height 750 mm, LED display, airflow velocity 0.3 – 0.5 m/s, main body made of cold rolled steel with anti bacteria powder coating work table made of stainless steel 304, side windows 5 mm toughened glass, anti UV washable polyster fiber pre-filter, HEPA 99.999 % efficiency at 0.3 mm, noise ≤60 dB, fluorescent lamp 21 watt, UV lamp 20 watt at 253.7 nanometers, electrical socket two of total 500 watt, 320 watt, 220V ± 10 %, 50/60 Hz. 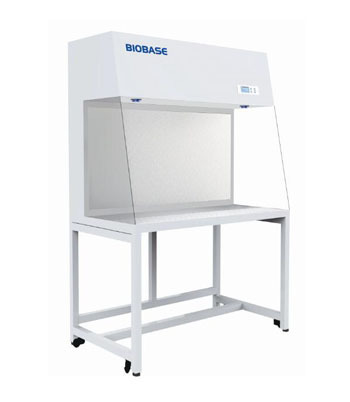 26 Agt 2016 - Laminar Flow Cabinet is a work bench or similar enclosure, which creates a particle-free working environment by taking air through a filtration system ... Model, BBS-H1100(Previous name:BBS-DDS), BBS-H1500(Previous name: BBS-SDS). External Size（W*D*H）, 1060*800*1690mm, 1460*800*1690mm. Model BBS-H1100(Previous name: BBS-DDS) BBS-H1500(Previous name: BBS-SDS) External Size（W*D*H） 1060*800*1690mm 1460*800*1690mm Internal - 6316062.